M. Mkt. M., M. V. Sc., M. Dance, M. Optom., MA, M.Ed. Eligible Candidates can Download NET Dec 2018 Admit Card at the Official Website of NTA. Applicants First Log on to NTA Official Website. 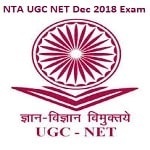 Click on UGC NET 2018 Link at Home Page. Open Download Admit Card Button. Select Download Admit Card Link. Download and Print Call Letter.